We work with non-invasive products with the environment and cutting-edge technologies for optimal maintenance of water quality. Many times organic mud accumulates in the bottoms of the lakes, emitting unpleasant odors in summer, decreasing water quality and visibility. These conditions can cause the death of fish and birds, and favor large proliferations of algae and aquatic weeds. Products based on Enzymes and Bacteria – To restore the nutrients balance. Food grade colorants – To filter UV rays. Hospital grade disinfectants – Necessary in case of a lake cleaning. 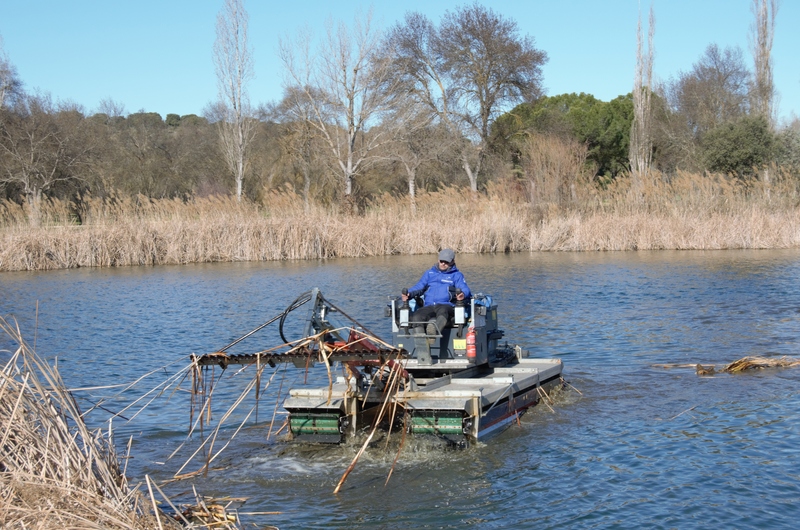 In case that before starting the treatment of the lake there is an algae flowering, it will be necessary to remove them and the use of hospital grade disinfectants to be able to start with the treatment. Bacterial products specially designed to digest sludge use the nutrients in water to convert carbon compounds (sludge) to CO2; denitrification occurs under anaerobic conditions (NO3 to NO2, to N2), and nitrification occurs under aerobic conditions (NH3 to NO2 to NO3). The result is a reduction in the levels of mud and nutrients that are available for the growth of algae and other aquatic plants. Release of organic substances and soluble nutrients. Mineralization of nutrients (conversion of nutrients to CO2 and water). Achievement of an improvement in water quality. 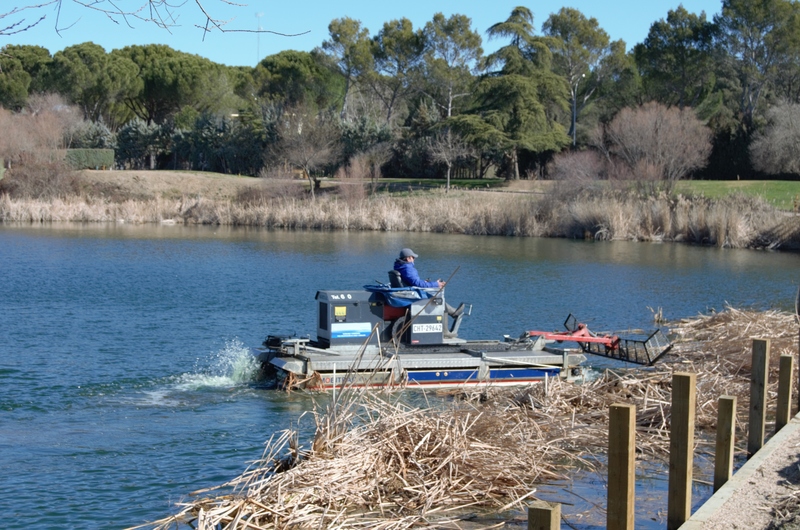 We have specific machinery and tools for cleaning the surface of the lake. This operation is necessary in case of flowering filamentous algae which will be removed and recycled according to current regulations. When? – Whenever there is a flowering of filamentous algae. Why? – To avoid it to rush to the bottom increasing the sediment and releasing more nutrients. How? – Using the machines and techniques that we have developed for this type of cases. It is very important to avoid the blooming-death-decantation cycle at the bottom of the lake because in each cycle nutrients are released that make blooms more and more important. Emerging plants – Phragmites, Cattails, etc. Submerged plants – Elodea, Foxtail, Hydrilla, etc. Floating Plants – Lemma minor, water hyacinth, etc. Emergent plants release part of their foliage during the winter that is deposited in the bottom and releases nutrients during its decomposition. Floating and submerged plants release roots and parts of their foliage that are normally aspirated by irrigation systems and cause obstructions. If they are not aspirated, they settle to the bottom and release nutrients during their decomposition. FLEYCCORP SL. C/ Archipiélago 5. CP: 28500. Arganda del Rey. Tel: 911 845 945.